The single most important element of warehouse construction is the quality of the floor. As stacking heights have increased, floor quality has become even more critical. Imperfections in floors are magnified when product is stored up to 30 feet high. Unfortunately, no part of the construction process is easier to get wrong and harder to fix than the floor. Traditionally, the pouring and leveling of the concrete slab involved extensive hand work that could be poorly executed by an unskilled crew. We have seen warehouse floors having an 8-inch thick slab in some areas with a 3-inch thickness in others. Also, if preliminary soil testing and proper compaction of the earth were not properly completed, a good warehouse floor can disintegrate, because the earth beneath it can settle. In extreme cases, industrial buildings have been torn down because repairs could not be made to poorly installed floors. The concrete slab floor of your warehouse is nothing more than a wearing surface. Because the earth beneath it is the ultimate support, it is critical that the soil beneath the floor is stable and well compacted before the concrete is poured. This can require that the earth be chemically treated to insure stability. Completion of test borings of the soil beneath the warehouse is absolutely essential as the first step in creating a sound floor. If lack of stability is indicated by test results, further steps must be taken prior to pouring the concrete slab. Mechanical screeds are now being used by floor contractors, to achieve maximum surface flatness through laser technology. The laser screed is a machine that serves as a giant trowel to eliminate the tedious and difficult job of finishing the surface of the floor. Tensile reinforced flooring systems combine steel reinforcement with an engineered polymer resin system, for a superior wearing surface. Quality of construction is affected by a number of variables, including weather conditions (temperature, wind and humidity), the formula of the concrete mix, and the skill of the contractor. Even if the construction is perfect, the concrete slab will shrink as retained moisture evaporates. This will widen the joints of the slabs, increasing the potential for deterioration of the entire floor. Another major cause of floor failure is the practice of "freight training." Some operators attempt to save time by pushing several pallets in front of the lift truck. While the practice might save time, it damages the truck, the pallets and the floor. Warehouse floors that have small grooves in the aisles usually have been subjected to this practice. Sometimes, the floor is damaged by chemical reactions. If your company is handling any kind of corrosive chemical, it is essential to discover whether that product could damage the concrete. If so, any spills of the chemical must be immediately and thoroughly cleaned. Floor defects will cause lift trucks to be damaged. Few lift trucks have pneumatic tires, and the more common cushion-tired vehicles are not designed for use on rough surfaces. When they encounter cracks or holes in the floor, the rubber tires of the lift truck deteriorate quickly. In extreme situations, the entire truck can be damaged. We observed one situation in which the dealer providing maintenance services refused to warrant truck repairs because of the poor floor condition. Floor problems also affect the vehicle operators. Repetitive jolts can result in fatigue or chronic lower back pain. In extreme cases, the absenteeism rate will rise, and the lift truck operators will quit their jobs. Productivity is reduced when floors are neglected. A sensible lift truck operator will reduce the impact from cracks and holes in the floor by slowing down as the vehicle crosses each bump, or by taking a detour to avoid the defect altogether. Either of these actions decreases warehouse productivity, and the financial loss increases as the floor defects worsen. Bad floors also have an impact on housekeeping and sanitation. Cracks in the concrete become repositories for dirt and debris, and dust from deteriorating floors settles on the stored product. Most sweeping machines cannot remove foreign material from deep cracks. Scrubbers leave moisture in floor crevices, which can become a breeding ground for mold, mildew and insects. Large cracks in the floor can also allow the entry of rodents. In one case, a restaurant supply company sued the contractor to replace a newly constructed warehouse, because the floor was faulty. Produce and other fresh food products accumulated in the floor cracks and joints, and the resulting rodent and insect infestation was intolerable. In summary, floor defects will result in vehicle damage and downtime, shortened life of lift trucks, increased worker absenteeism and turnover, higher workers' compensation insurance rates, reduced materials handling productivity, and unacceptable housekeeping and sanitation. The sum of all these factors is substantially higher cost and reduced profit. The most common floor repair is filling or fixing joints and cracks. 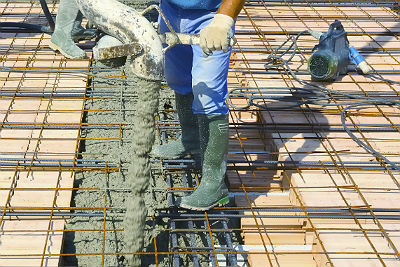 Joints are affected by normal shrinkage of the concrete slab. As a rule of thumb, a 6-inch thick slab can shrink one-eighth of an inch for every 20 feet. If there is a 1/8-inch joint in this slab, it eventually will open to twice that size. Most of the materials used to fill joints will accommodate only a 5 percent to 10 percent expansion. The larger the slab panel, the greater the potential for random cracking. Joints are significantly less expensive and easier to repair than cracks. Slab shrinkage varies directly with thickness. A 12-inch slab has far smaller shrinkage potential than a 2-inch slab. Because concrete does not reach its optimum strength for at least 14 days, avoid or minimize heavy loading of the floor during that time. If vehicles must roll over green concrete, they should be only trucks with pneumatic tires. When concrete dries, it can lift upward at the edges. This curl can force the slab edge to lift above the grade, causing it to break when struck by loaded vehicles. Floor cracks and deterioration of slab joints have been challenges since the first hand truck was pushed over a warehouse floor. The problem worsened when forklifts were introduced, and became critical when 40-foot high rack installations became common. Unfortunately, warehouse operators usually ignore floor problems until they become severe. At the same, it can be prudent to delay repairs until a new floor is completely cured, and slab shrinkage has ceased. The primary purpose of joint filling is to restore the surface continuity that would exist without the joint. The filling process replaces the concrete that was removed. The ideal filler is soft enough to expand as the joint widens, but hard enough to withstand forklift impact. Semirigid fillers are the closest to the ideal. They have a hardness comparable to hard rubber. An estimated 80 percent of joint fill installations are improperly performed. Preparation of the slab joint through cleaning is essential, and the filler must be installed to full joint depth, to prohibit the filler material from sinking to the bottom of the cavity. Done correctly, the cost for joint repair will be a minimum of $2 per lineal foot for labor and material or twice that much for repairs in a cooler or freezer warehouse. Occasional cracks need not be a source of alarm, but if they become numerous or severe, an engineer or architect should be called to identify the source of the problem. If the concrete floor is still curing, a crack cannot be repaired by a method that restricts its movement. For example, a crack that is welded with structural epoxy probably will generate a parallel crack. Your concrete floor is the work surface for your vehicles, and the platform for the material stored in your warehouse. No part of your facility is more critical to the effectiveness of your operation. Leaky roofs or damaged doors and walls, are relatively easy to fix. A bad floor that severely hinders the flow of material in the facility can be impossible to repair. For these reasons, it is extremely important to build the floor well, and then maintain it carefully. Ken Ackerman has been active in logistics and warehousing management for his entire career. He is editor and publisher of Warehousing Forum, a monthly subscription newsletter. Since 2007, he has also been a group chair for Vistage International, the world’s leading chief executive organization. Before entering the consulting field, he was chief executive of Distribution Centers, Inc., a public warehousing company that is now part of Exel Logistics USA. In 1980, Ackerman sold the company and joined the management consulting division of Coopers & Lybrand. Later, he formed the Ackerman Company, a management advisory service. You can reach Ken at ken@warehousingforum.com.